I don’t get to post on the mosaic as often as I did but I do a tape e v e r y day. I even have a note from my doctor that I can tangle at work in downtimes because it helps with stress…my boss required it! remember EVERY DAY! Thank you for the reminder by reposting this blogpost. I truly think think the Zentangle process more important than the result. I always try to teach this in my lessons too. There is a quote that expresses why you think your work looks less than that of your neighbours in class: “When you are in a workshop and feel that the work of the people on either side of you is better than yours, you think that because you see their work for what it is and your own work for what it is not” . I use this quote often and regret not knowing who came up with it. I am looking for a while zentangle art. And I started last week at the moment in my life I need it. I really love the results on each tile. Love that zen art. Now I want to learn more and more tangles. I started learning how to Zentangle in August when we started house hunting. There were many twists and turns as we found houses we liked and because of the tight market lost out in the bidding. My daily journal of Zentangles shows how I used “one line at a time” to stay calm, relaxed and hopeful during stressful times. I am so appreciative of the process which is now helping me stay focused as we pack to move to our new home!! I keep my Tangle Journals as a reminder of how far we’ve come and my own personal growth as an artist. Thanks to Julie, Maria and Rick for keeping us all sane and “in line…”LOL! Hi Julie! Thanks for sharing your words about comparing your work with others, and the feelings you had in the past. This Is something I must remember to my students frequently, and I agree with you, it’s only when you enjoy the process one stroke at a time with no expectations about the outcome when your feelings flow and let you feel you’re an artist. I’m going to use your example in my classes. Greetings from Madrid, Spain . Always happy to revisit these vintage blog posts. I teach Zentangle in the only art store in Anchorage where I am surrounded by the most talented artists. Many worldwide famous artists! My husband is one of those. And many of my student’s Zentangle art is absolutely spectacular (they are way beyond me!!). I did not know how to draw until I found Zentangle. When I first started teaching, I was very intimated and felt inadequate in sharing my simple art. But as I learned more about Zentangle and got more into my own practice, I asked myself, “What is my goal? Do I want to be the best tangler in the world or do I want to simply enjoy the process of relaxing and just tangling, and enjoying all the wonderful benefits I get from tangling?” I no longer am intimidated. It is not about the art or the outcome for me (although I am still always shocked that I can draw! ), and besides, most of the time I have no idea where it’s going and what I’m going to end up with. It doesn’t matter. For me it’s all about “totally enjoying the process of putting that ink to paper”, the fun and the warm fuzzy feelings I get when I tangle. I “de-stress”! I am finally at peace and in a whole other world when I tangle and that’s what I try to teach my students. Zentangle has taught me many valuable lessons, which I’m grateful for and I carry with me into my real life! Someone please create a tangle that represents the absolute and genuine positivity that flows from one artist to another on the Mosaic wall! I am always so impressed by the lovely comments posted and encouraged by seeing how everyone helps and compliments, finds positive things about the work of even the most unpracticed artist. That is not seen in any other field that I can think of these days. It’s a great honor to be part of a group like this! I love the way time disappears as I tangle, the getting lost in the drawing of deliberate strokes and how one line inspires the next, unplanned. Also: what wonderful Pokeroot, Julie – they each wear a little smile! Lately I’ve spent more time practicing tangles in my sketchbook than drawing on tiles. I’ll pick a tangle that I want to learn, give it several tries, and experiment with different Tangelations. I’ve had a lot of fun this way partly because I don’t feel pressure to have perfect tangles or a perfect string. I can just sit and draw. When I go back to doing tiles, my tangles will look even better! What a great reminder – thank you! I love this reminder because I, too, think that my tangles are not good enough to post on the Mosaic. I just recently posted one for the first time. I use Zentangle to help me with my depression and I love to tangle the same favorite tangles when I am feeling bad. I don’t think that I could do too much “marasu” or paradox, they are such fun. Thanks for the re-post. I spend lots of time in dr. offices, waiting rooms, hospital rooms with my parents and husband. Sometimes it feels like I am simply re-tangling those tangles that I know best because I don’t have time to learn new ones…but nurses, other patients, other family members love what they see me creating! So I have settled in my mind and heART that re-tangles are more than ok…they keep me focused, calm, and the time passes quickly. Don’t know where I would be without Zentangle! Thanks! Thank you Julie for a very timely reminder. I have become consumed recently by my ever-growing To Do list, feeling overwhelmed and a little panicky. When this happens, I have to remind myself that THIS is why Zentangle is so important to me, and why I should aim to tangle at least once a day if I can. It calms me, creates clarity and space in my mind, lifts my mood, refreshes my confidence and reminds me that I can create lovely tiles and if I can do that, I can do anything I set my mind to. I absolutely love seeing others’ work and their beautiful creativity, and I try hard not to compare myself unfavourably. The process is the beauty, the end result is the cherry on the top. This is so true – thanks for the reminder. My zentangle practice is something very personal, but it can also be very interactive without taking away from the personal part. I love sharing my ZT art, seeing the reactions of others, being inspired (hopefully without getting discouraged!) by the tangling of others, and collaborating where each artist’s style is enriched by the other without being swallowed up by that of the other. Balancing individual and community. 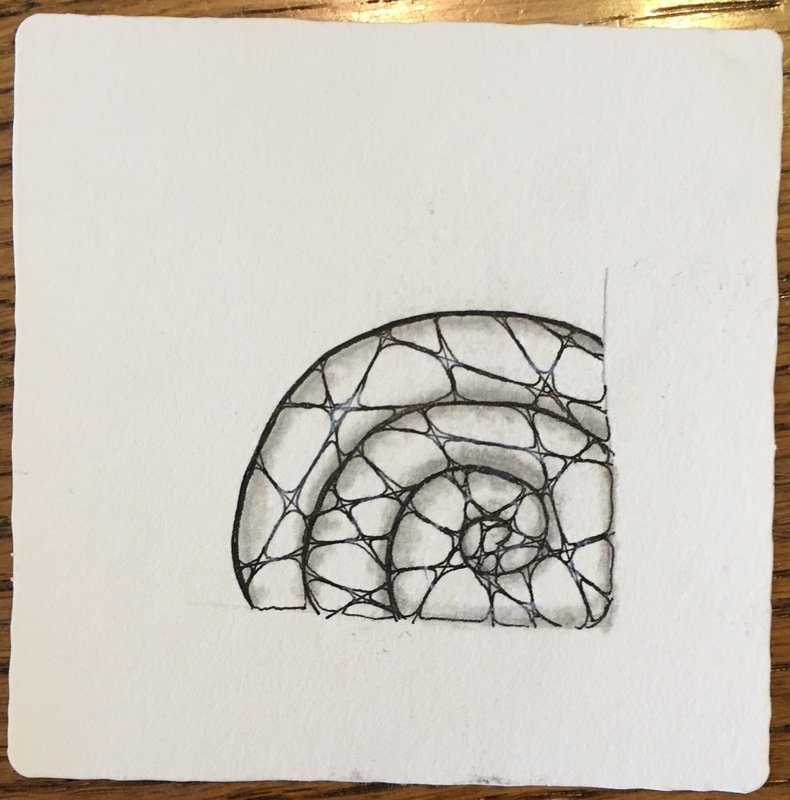 . .
As someone new to Zentangle, but not new to the meditative feelings that are a result of Zentangle practice, this post is so timely. Getting daily tangling time is critical to my well-being. Learning new patterns, without judging my results, is teaching me to “Let go”. I can see a difference in me already! Many thanks to Maria, Rick, the Zentangle crew, and all who continue to teach me. Many thanks for this re-post. It is the “kick start” I needed to get me back on track. This is a constant discussion with many of my classes and regular tangle groups. We are all admiring of everyone else’s work and constantly are critical of our own work. But I am always reminded that Zentangle is all about the process, not the outcome. If we end up with something lovely to look at that is a bonus. The real value is in the process. I remind myself of that every day, and remind my students of that as well. I like to remember the love! and enjoy knowing there is always a place to tangle, no matter where I am or what’s going on, it’s a way of tuning in, a practice similiar to meditaiton, where a deep joy of just being is. My daily practice is SO incredibly important to me. This summer has been incredibly hectic and fraught with drama I really didn’t need. It’s left me precious little time to tangle, but I find time each and every day to make at least one tile. Inktober has been a true blessing this year. And I’m not comparing my work this year, but I’m LOVING all of the artwork that everyone who posts on the Mosaic and the FB groups have been sharing. I’m using so much of what I see as inspiration to make my own tiles and continually develop my own style. And yes, Julie… it’s all about the journey. I’ve finally come to understand that deep in my bones and embrace it. Love to all at HQ…. you have brought something into my life that I can never adequately express my gratitude for but I work on it each day. All my life I have struggled to draw, and wanted to be able to create beautiful things, but I couldn’t. Now, I create beautiful pieces of artwork thanks to the Zentangle Method of art. It brings me such great peace, focus, gratitude , mindfulness, joy, and shows me with just one stroke of my pen, I can create beautiful art for myself and others. It’s a nice feeling that so many people that see my art love it, but more important than that, I love creating it and the surprise outcome I get from it with each piece that I draw. I have never been so happy as when i’m tangling or teaching others that there is an artist in each of them and seeing the surprise looks of joy on their faces, when they see what they have created with their own hands! And now I’m using my talents to create dragonflies for those that have lost loved ones to help support their grieving process, as, I too, have lost a loved one. The process brings me calm, peace and joy. Sometimes the result brings a surprising pride “I did that?” other times it brings different emotions. It always brings gratitude for the practice itself. Awareness, intention, inner focus, reflection, and gratitude are staples in my practice. I am so grateful for this journey. I embrace Zentangle with heaps of gratitude. 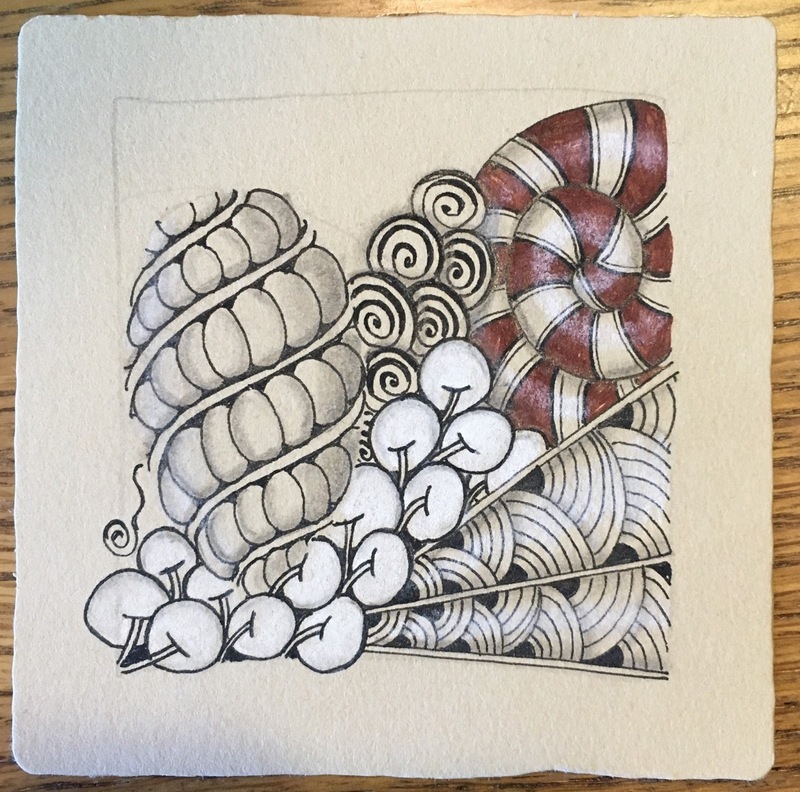 My CZT, Joanna Quincey has beautifully combined my Zentangle lessons with personal coaching. I take time out daily now in formal gratitude practice to appreciate every different aspect of my life. In the morning I appreciate my tile as I sit down to tangle. Later in the day, I take time out to express my appreciation for my family, and my job. When something “goes wrong,” I will say a gratitude to remind myself that while today something isn’t going my way, that LOTS of things do go my way every day and every hour. 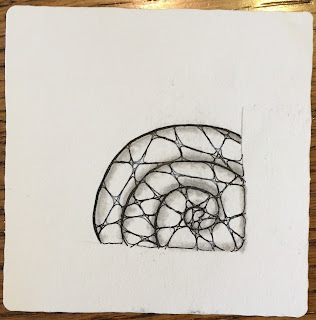 Here is a good time to express my gratitude to you all at Zentangle Inc, for this amazing practice that is already – after not even 8 weeks – changing my life. Thank you for the reminder. I have been getting to critical of my own work lately, and too envious of others` work of late. Getting back to my roots and trying to work with `official` patterns as my daily practice. I love Zentangle!